If you want to export, make sure you understand the basic terms of shipping (including pricing and documentation). You must also understand the responsibilities of the major players for safe delivery of your products to buyers. Details such as duration of shipment, types of transport modes, conditions required for different products and the agreed terms for the export must be well understood. 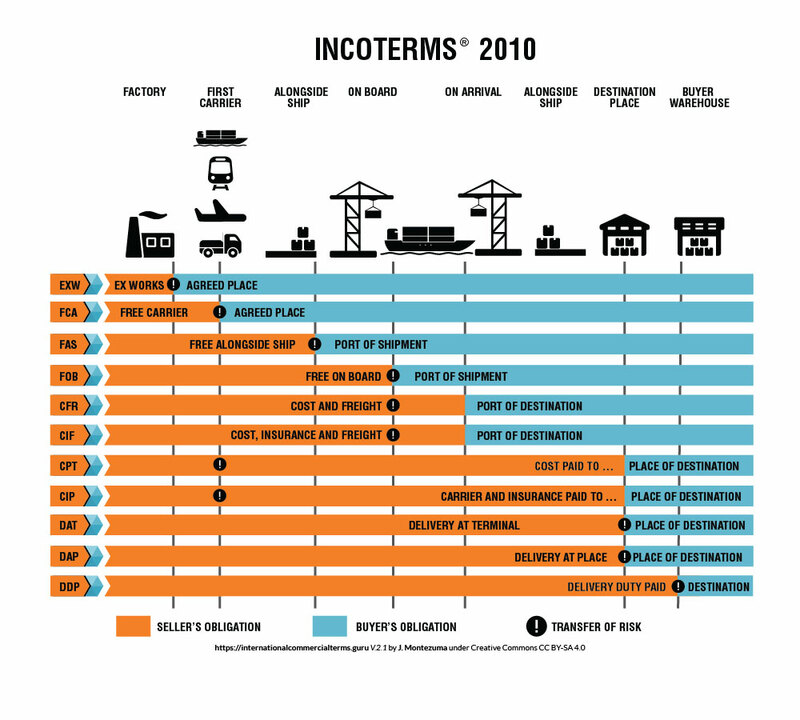 INCOTERMS is an acronym for International Commercial Terms. These are internationally recognised terms in international transactions. It provides details on the responsibilities of buyers and exporters. The terms are important for the processing of shipping and payment documents during exports. Basically, INCOTERMS defines all obligations of buyers and sellers within the logistics chain. The picture below (source: internationalcommercialterms.guru) clearly outlines these obligations under different agreements. It specifies the responsibilities of the buyer and the seller per agreement including the point of transferring the obligations (transfer of risk). Looking for more detailed explanations on INCOTERMS and the different possibilities? Find out everything you need to know on the INCOTERMS rules. Always undertake due diligence on your buyers before exporting! International Chamber of Commerce (ICC) provides information about the incoterms rules. These rules have become an essential part of the daily language of trade. They have been incorporated in contracts for the sale of goods worldwide and provide rules and guidance to importers, exporters, lawyers, transporters and insurers.